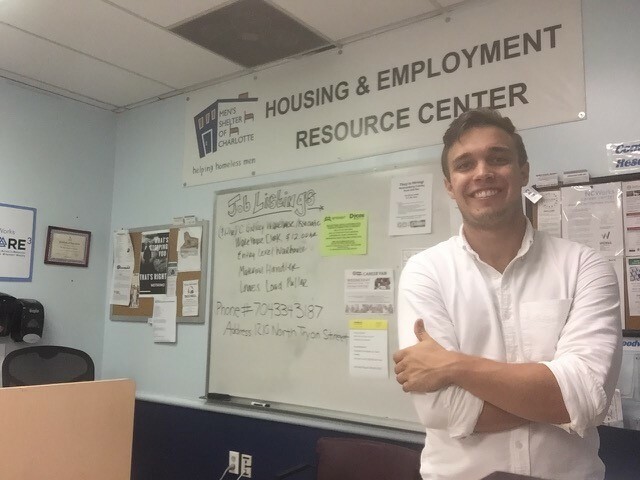 When I started volunteering in the Housing and Employment Resource Center (HERC) at Men’s Shelter of Charlotte two years ago to help men build resumes, apply for housing and search for employment. I saw the experience as a way to familiarize myself with the needs of Charlotte’s homeless community. I was in my first year of teaching at Garinger High, where roughly 5% of the student population is homeless. Through the shelter’s guests, I thought I’d be able to learn about the city’s complex social service system so I could be a better resource for my students and their families. Fortunately, the dozens of men whom I’ve grown close to over the past few years have taught me about more than how to navigate that system; they’ve taught me how to be human. When I walk into the HERC, I feel part of a community that genuinely cares for its members. It’s not all “business,” and for the sake of sanity it can’t be; politics, sports and family are just as important topics of conversation as housing application statuses and job interviews. Even when the end game is housing, life has to continue – helping men with that balancing act is what keeps me coming back each week. Visit out website for more information about the HERC or to sign up for other volunteer opportunities!